Goal: Generate one-sided traffic to a network device with a fixed destination IP address. 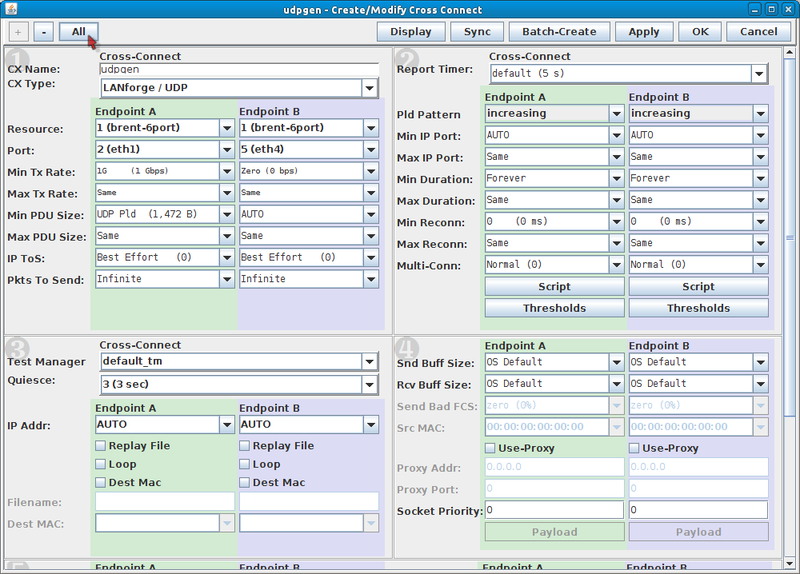 This scenario is useful for testing switches, firewalls and data loggers that have to handle highly varied or very fast UDP packet streams with a fixed destination. A one-sided traffic stream is used to send packets to a network device under test when round-trip reporting is not required. On the Port Mgr tab, select a port within the table and click the Modify button. This example will use port eth1. 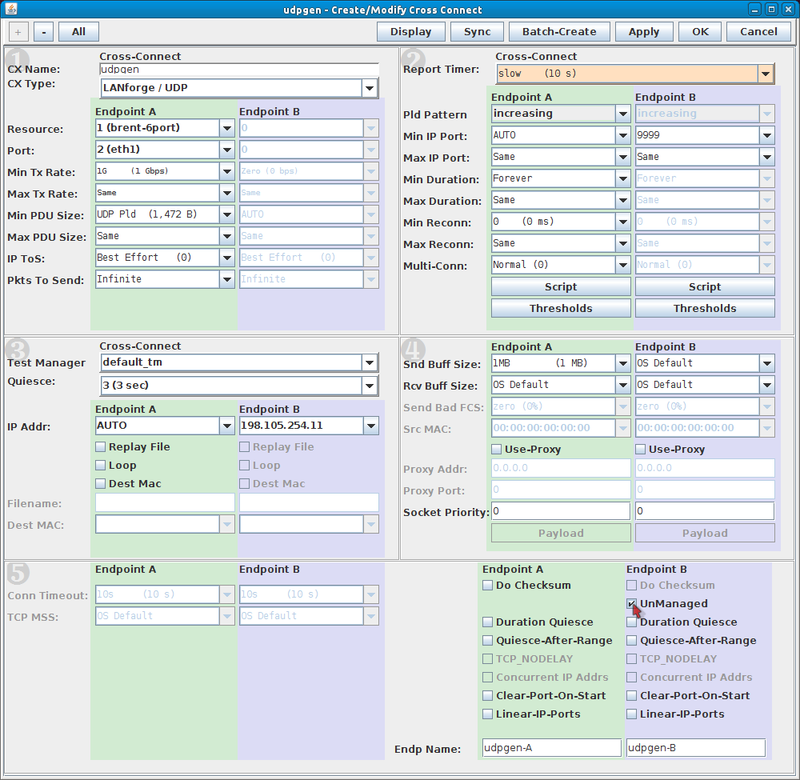 Assign an IP and Mask as necessary. On the Layer-3 tab, click Create. Assign port eth1 to Endpoint-A. You will not need to assign Endpoint-B because that will become unmanaged. Use the All button at the top to expand to the last detail level. In section 5, on the right side, Endpoint-B (blue), select UnManaged. This will gray-out most of the Endpoint-B options. In section 2, set the Report Timer to slow (10 s). 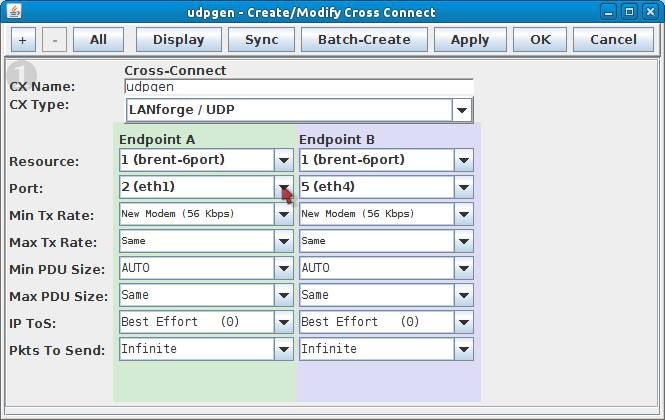 Also, set the Endpoint-B Min IP port: 9999. If you have a service under test this port should match, if not, this setting still needs to be present to generate valid traffic. In section 3, set the Endpoint-B IP to the system under test IP address. Our example shows 198.105.254.11. In section 4, set the send buffer size (Snd Buff Size) to 1MB. Click OK at the top to commit the changes. 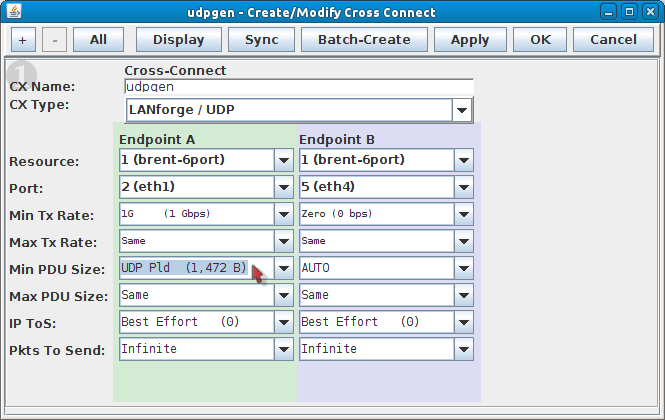 In the Layer-3 tab, select the connection udpgen.